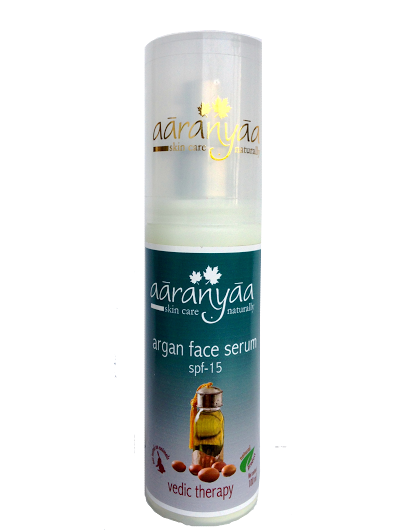 Vedic Natural Care , pioneer in natural skin care products has come out with its latest Aragan oil based Face serum with spf-15. This face serum has Aqua,Argan Oil,IPP,Glycerin,Benzophenon,,Shea Butter,Vitamin E Actetae,Niacinamide,Extracts of Alovera,tamarind,Licorice & Ashwagandha and Hyaluronic Acid as the key ingredients and this This perfector and prorector serum provides even tone and silky feel to facial skin besides protection from the UV rays.Argan oil 100% absorption properties ensures that not a drop of oil remains on the skin. This the 5th product from Vedic natural care under the Argan range after its Spa at home- Hair pack , body lotion , Eternity- body butter and Argan sulphate free shampoo. Aaranyaa products are available in Delhi NCR through 250 outlets. With the range of 48 products in their kitty right now,Aaranyaa plans to launch 24 new products in coming year and lot more surprises for the brand connoisseurs. Combining the expertise and skills of different people with the common passion Aaranyaa – Skin care Naturally! has become one of the most trusted brands in skin care segment and in the household of discerning Indian consumers. Created under the discerning eye of Dr Parashuram Singh, a world known cosmetologist with over 40 years experience and head of research of Elizabeth Arden for 18 years, Aaranyaa offers the highest quality in its products and even confirms to US FDA standard. Keeping in mind the specific need of the various parts of human skin including Hair, face, body and foot, Aaranyaa provides an extensive range of products to suit all skin types.